Comfortable King oversized bedding is a must have option on your King size bed. Our Down Alternative - Ultra Cozy Duvet Insert - King (109" x 100") will add incredible comfort to your King bed. With the perfect King extra large size of 109" x 100" this comfy King XL comforter insert uses its soft microfiber outer shell and high quality down alternative polyester inner fill to provide you with the best comfort for your King sized bed. The normal size for a King duvet cover is 104" x 90" but don't let that stop you from adding this essential oversized King duvet insert to your King bedding. This cozy extra long King comforter insert will fit into a King duvet cover that is a few inches smaller and fill it out, giving you comfy King XL bedding that is to die for! With oversized King bedding like this comfortable King XL duvet insert, you never have to worry about properly covering your King bed again. What could be better than that? 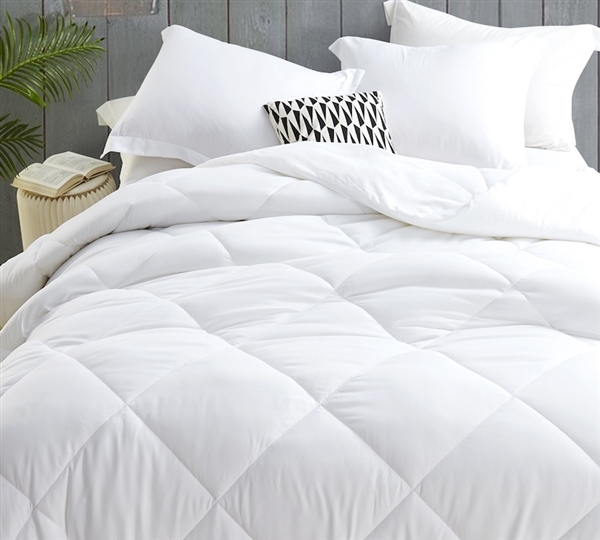 How about the affordable cost of this King XL comforter insert that gives you luxurious King extra large bedding without the high luxury cost? At Byourbed, we believe in Luxury for Less when it comes to your extra large King bedding, so that sounds great to us!